FREE Holistic Wellbeing and Tarot eBooks for Instant Download! COURSE BUNDLE WITH BONUS GIFTS. Angelic Tarot is a 6 week self-study course and Intuitive Tarot is a 4 week self-study course. These two courses are ideal for the intermediate Tarot student and can help take your reading skills to the next level. Will be emailed to you within 24 hours of purchase. FREE – CLICK HERE to download! 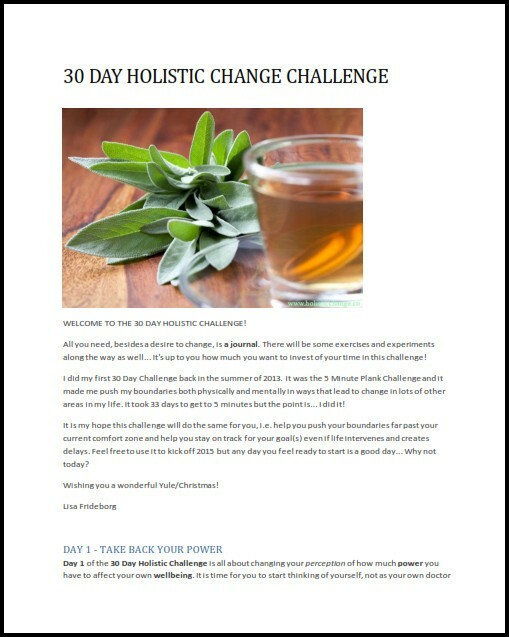 30 Day Holistic Change Challenge eBook – upcycled from the Holistic Change blog and great to use any time you fancy a change. 73 page PDF. Did you enjoy your eBook? Please tell us which eBook you are reviewing in the Review Title field. Thank you! Very useful e-books. They not only further explain tarot card meanings past keywords and phrases but give practical advice on how to use Tarot card energies. I found in these books a valuable resource for using angelic, crystal, elemental and herb associations as well as the cards themselves to help in holistic healing applications. Excellent reference book worth every penny and more! If you think you don't need any more Tarot books on card meanings, then think again. Lisa's personal and unique interpretation of the cards makes much more sense to me than those from some of the well-known so-called Tarot scholars. This is the kind of book you will refer to often. Great Spreads and Insightful Info! I've been a big fan of Lisa's websites and spreads for a while now and being able to have a easily accessible version of her amazing words of wisdom and well crafted and thought of spreads is truly invaluable. I'd recommend any and all of her material to anyone interested in the esoteric. Also, highly recommend opting for the regular newsletters as well.